I went to the March for Science in Washington, D.C. on Earth Day, April 22, along with thousands of other people from across the country. I had been looking forward to the march for some weeks, in part because I’m interested in science activism, and in part simply because I was excited to see my family from D.C. The experience, on the whole, was a nice blend of the two. With thousands of scientists from a variety of fields, a speaker series including Bill Nye, great jazz performances, and a lot of awesome posters, the March for Science was in many ways a success. It also served as a release for pent-up frustrations over a lack of governmental support for science, specifically regarding climate change. The question remains, however, as to what effect this will have on the Trump administration. Scientists and science activists from across the country assembled near the National Mall in D.C. the next morning. 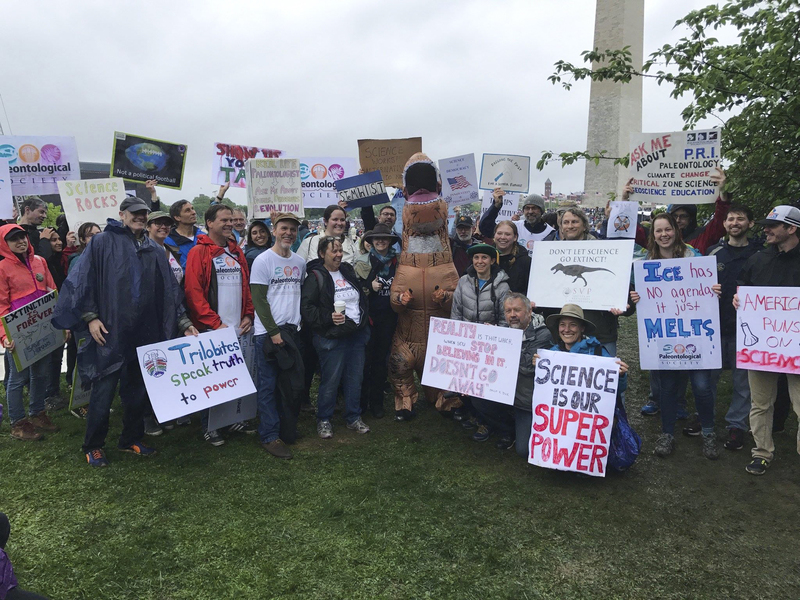 The Paleontologist Society gathered a few blocks away from the Washington Monument and then trekked down together, along with groups of other scientists and science activists. It was a particularly wet and miserable day, especially for spring, and it rained on and off (but mostly on) for the entire round of speeches and subsequent march to the Capitol Building. The Paleontological Society found a spot that had a good view of the large screen displaying the speakers on the massive stage and settled in for a few hours of speeches and performances. Science Marches took place in over 500 cities, but the march in D.C. was the largest. Estimates place the number of people who marched in Washington at around 40,000, and it felt like even more with massive crowds present both during the speeches and the march itself. The individual speeches themselves moved very quickly and ranged in subject matter. Many addressed science education, conservation, and, of course, climate change. Towards the end of the series came Bill Nye, and with him, a surge of energy in the crowd. The speakers also notably included Maya Lin, an American artist who designed the controversial but notable Vietnam Veterans Memorial. Prior to her speech was a poignant video, featuring footage of environmentally degraded land and endangered animals. The diversity of speakers is indicative of the sheer variety of people who are involved in areas of science that are not solely research-based. For example, photographer James Balog, who is best known for the documentary “Chasing Ice,” was also present. After the speeches finished, one of the hosts directed marchers to the street, and the march to the Capitol Building began. For the first 15 or so minutes, the rain had stopped and musicians played in the background over huge loudspeakers. The energy was incredibly high. The rest of the march oscillated between heavy and light rain, and walking and stopping. My poster, by the end of the day, was thoroughly wet and tearing down the side. The word “Melts” looked like it was actually melting. Others included simple chants of “EPA! EPA!” and once in a while, a massive “Whooo!” that ran from the front of the march to the back in a wave. Though everyone was squeezed in together, it never felt claustrophobic, and interactions between marchers were positive and friendly. When we arrived at the Capitol Building, participants began milling about or headed home, thoroughly soaked, but in high spirits. Despite the fact that the event was intended to be bipartisan, much of the rhetoric was anti-Trump, particularly on posters that directly addressed “alternative facts” or Trump himself. This conflation of science with liberalism is the source of controversy surrounding the march, in that it potentially perpetuates the idea that scientists are merely another interest group. On the other hand, it is notable that the Trump administration has made it explicitly clear how low climate change and sustainable policies are on their agenda. And, as some scientists noted on their posters or in speeches, science can be very political. It’s difficult to quantify the effect this march will have on legislation in the future. In the end, however, this march provided a method through which scientists could speak their voice, and people in support of science across the nation could come together. It was, to me, a successful event, and I’m proud to have been present to share my voice.